Tomorrow sees the European release of Rush Rush Rally Racing (R4) for WiiWare, nearly 18 months after it was first announced. We sat down with developer Senile Team's Jeroen and Roel van Mastbergen to talk racers, future releases and WiiWare. Nintendo Life: Firstly, please introduce yourself to our readers. Senile Team: Hi readers! We're Senile Team, a tiny indie developer with a love for 2D gaming.. We are probably best known as the creators of Beats of Rage, a freeware modifiable beat 'em up engine which many of you probably heard of at one time or another. NL: Can you sum up Rush Rush Rally Racing in a few sentences? ST: Rush Rush Rally Racing is a fast-paced 2D racing game. 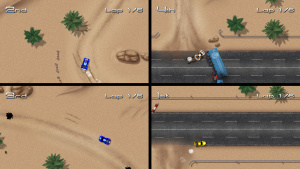 It is quite retro and clearly inspired by old classics, but it also features many things that such classics didn't have, such as ramps, tunnels, night time races, smoother physics and four-way split screen. NL: Originally R4 started on Dreamcast of course. What prompted you to develop a new Dreamcast title so long after the console went off the market? ST: The Dreamcast has enjoyed a relatively active scene following even long after its discontinuation. 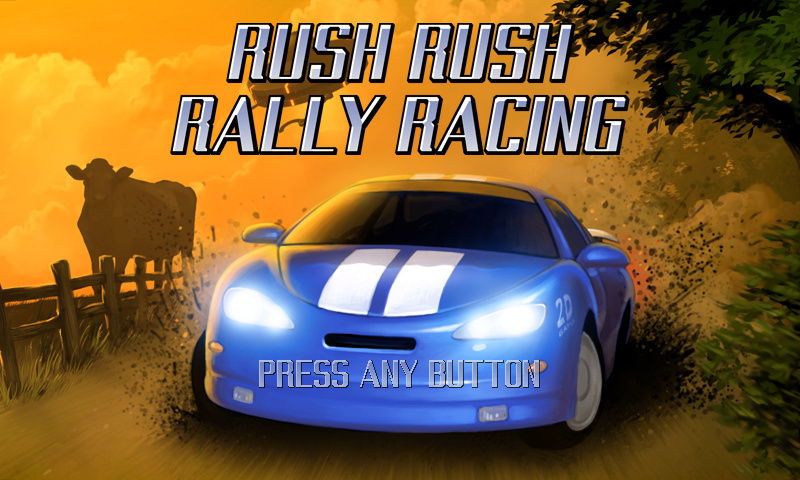 One of the Dreamcast communities organised a game programming contest, and Rush Rush Rally Racing was intended as our entry. Unfortunately the contest was cancelled because sponsor Lik-Sang went out of business. Rather than throwing our hard work in the bin, we decided to expand and complete it so it would be fit for a commercial release. NL: What games inspired R4? 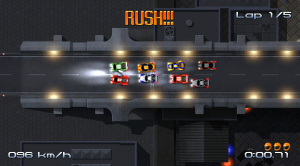 ST: RRRR was inspired by Micro Machines (Mega Drive), Combat Cars (also Mega Drive) and Thrash Rally (Neo Geo), but we're proud to say that it is a unique game in its own right and certainly no clone of any of the aforementioned games. NL: What made you want to bring the game to WiiWare? ST: The Wii seemed like the best candidate for a port, hardware-wise. For example, its screen resolution and number of controllers are comparable to the Dreamcast's. Additionally one of our team members already had some experience with WiiWare, having worked as an artist on one of the first WiiWare titles. NL: It's been about 18 months since you first announced R4 for WiiWare — what improvements have been made in the Wii version compared to the Dreamcast release? NL: What else should our readers know about the game? ST: If you like a game that gives you an old-fashioned adrenaline rush, some (dark) humour and an addictive challenge, this is one you'll love. And at only 900 Nintendo Points, it's a steal! NL: Do you have any further plans for games on Nintendo formats? ST: There is a good chance you'll see more of us on a Nintendo platform. But it'll most likely be a new game, not a port from an existing Dreamcast title. NL: Anything else to say to our readers in closing? ST: We hope you'll have a ton of fun with our game! Cheers! Thanks to Jeroen and Roel for their time. These guys sound enthusiastic about creating wiiware games and all the best to em. Now this looks like a cool racer inspired by Micro Machines on the Megadrive, many great memories of 2 player mayhem on that kitchen table and garden track I'm gonna get this game. I will definitely pick this up. Way before "Micromachines" I already loved this kinda games on the Amiga ("Supercars", "Nitro", etc). Anyway, I'm always interested in a good racer (got Excitebike World Challenge, Art Style light trax, MotoHeroz, FAST - Racing League, Driift Mania and Stunt Cars for WiiWare). RRRR and TNT Racers are on my radar. Demo wanted. I'm cautiously optimistic about this...but wish it was on the 3DS. I think WiiWare is just about vanished from every gamer's radar, it will be hard to get a return on their hard work and enthusiasm . "Most of that time was wasted on bureaucratic drivel." Same case with MDK2. I don´t know why Nintendo enjoys to trouble small developers. I like to download this kind of games and I don´t know why Nintendo limits they own support to the console. This definitely looks promising. WiiWare still has some life yet thanks to this game, Retro City Rampage, and La Mulana. How is 9 dollars a steal for a Wiiware game? Thats almost 1/2 a point card! Are they really called Senile team?! That's the best name ever! @Knuckles I'm guessing they mean that for how good the quality of the game and the amount of content, $9 is a great bargain. And considering that some downloadable games are more fun than many $50 retail releases, it's probably a fair statement. Hmm... remember that game Karnaaj Rally? You know the one which nobody played because like, the boxart totally sucked? @TooManyToasters, this is on the WiiWare service my friend. I guess the developers aren't the only ones who are senile.